ZoogVPN has a weird name for a VPN service. Is it any good? 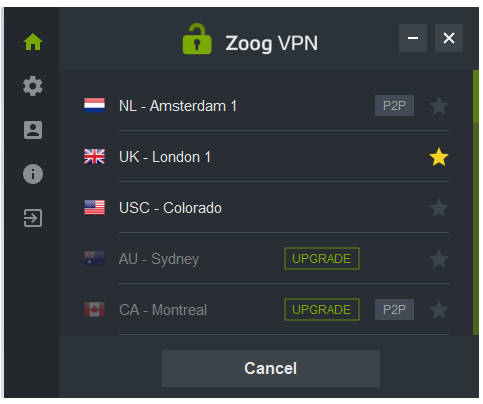 ZoogVPN started offering its VPN service back in 2013. This VPN service provider operates out of Isle of Man. Initially ZoogVPN called its VPN service ZoogTV. In other words, the company has evolved since its early days. It has improved and changed numerous aspects of its VPN service and general operations. These changes include the company bringing down the price of its packages. And now, ZoogVPN packages have become more attractive than the average VPN service provider in the industry. ZoogVPN is still far away from a perfect VPN service provider. But from a general perspective, this Virtual Private Network service provider does have a lot of positive things going for it. Depending on the type of user you are, ZoogVPN might just fulfill all your VPN needs. Our ZoogVPN review will tell you everything you need to know about ZoogVPN. We’ss discuss the various methods with which you can access its VPN service with the help of a paid subscription plan. We’ll also talk about the company’s free VPN service. Moreover, we’ll discuss how users can set up the VPN service on their machines. Finally, we’ll divulge the details of the quality of ZoogVPN as a VPN service providers. For more tips and tricks, you are going to have to read out full ZoogVPN review. Firstly we should talk about the company’s free version of its VPN service. 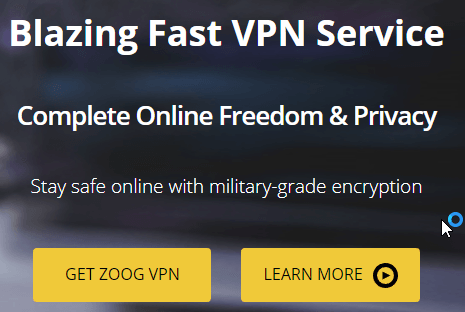 ZoogVPN provides all its potential customers the opportunity to use its VPN service for free in order to try it out. That way users can check ZoogVPN VPN service’s quality without the need of risking any of their money. But there are also paid subscription plans. These subscription plans provide users with other forms of payment protection. In other words, all of the ZoogVPN subscription plans come with a seven-day money back guarantee. So is the free VPN service the same as the paid VPN service? The free version comes with some limitations. Firstly, with the free VPN service users don’t have access to all of the company’s VPN servers. 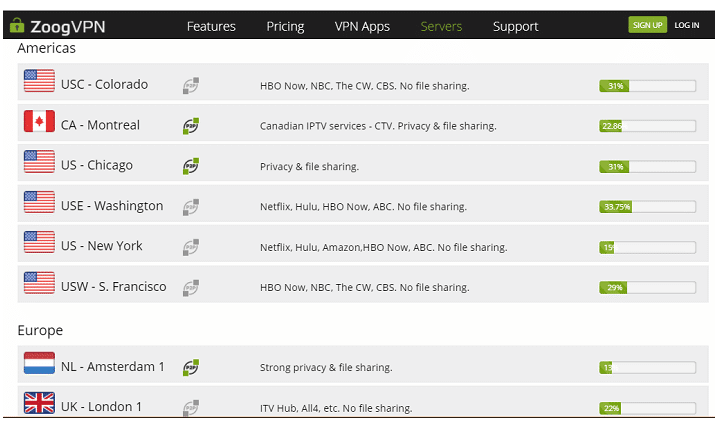 ZoogVPN operates a lot of VPN servers but it only allows access to them if the user has bought a subscription plan. Free VPN users only have access to three VPN servers. With that said, there is always a chance that you might hit good luck and discover that the three servers ZoogVPN is offering with its free plan are the ones that you need. What we mean to say here is that ZoogVPN offers free VPN servers in very popular locations. Free users have no guarantees that the company would offer them top VPN server speeds. Moreover, ZoogVPN is clear on the fact that it does restrict the bandwidth that it offers to free users. The company must do that in order to make sure it can maintain fast speeds for all of its paying customers. We would say that is fair enough. Our research for this ZoogVPN shows that even while using the free version you won’t find any of the servers near its full capacity via the server report page. Hence, why would the company need to throttle the bandwidth of free users? The free VPN service comes with another restriction. And this restriction may push you to either buying a ZoogVPN subscription package or go to another VPN service provider. That restriction is the monthly data limit. ZoogVPN limits the amount of data you can transfer via its free VPN to just 2GB per month. Hence you can’t really play online games with the free VPN service. You can’t even stream video with this little data throughput. If you do try to play online games or watch videos which such a low data limit then you will probably use up your allocation within a few hours if not earlier. 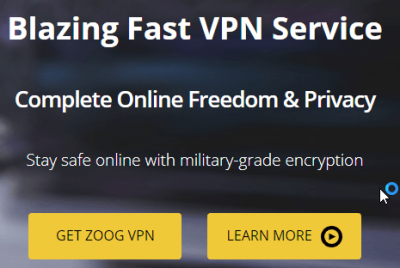 Since ZoogVPN has reduced its subscription package prices, it has become one of the most economical VPN services that you can find on the market today. Additionally, you can subscribe to ZoogVPN with its longer-term subscription plans. That will fetch you even more discounts. ZoogVPN doesn’t have a one-year plan. But it does have a two-year plan. The two-year plan gives you a huge discount. On the two-year plan, ZoogVPN becomes so cheap that most other VPN service providers in the market charge you more for two months than what ZoogVPN charges you for two years. Bitcoin is great for people who want to make sure that they don’t even come close to exposing their privacy and identity while signing up for ZoogVPN. ZoogVPN offers the same features for all its paid subscription packages. The company offers a free version of its paid VPN service. But it comes with certain restrictions. 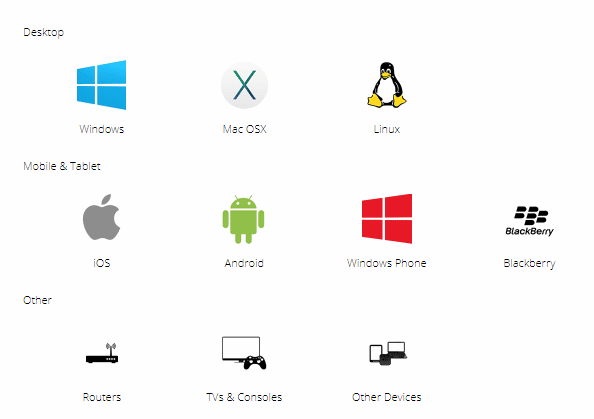 The company has dedicated apps for all major platforms such as Android, iOS, Mac OSX, and Windows. ZoogVPN offers OpenVPN connection through its VPN apps. It also offers PPTP (Point-to-Point Tunneling Protocol) along with L2TP (Layer 2 Tunneling Protocol) and IKEv2 (Internet Key Exchange version 2). 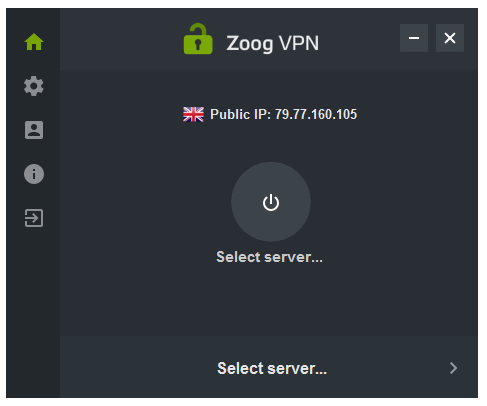 ZoogVPN has VPN servers that are located in 17 countries. As mentioned before, the total number of VPN servers reaches over 25. ZoogVPN implements the OpenVPN protocol via its custom VPN apps. Users are allowed to implement the OpenVPN standard with various levels of online security. In other words, users can implement OpenVPN by selecting from several encryption ciphers. Hence, the actual security of ZoogVPN apps via the OpenVPN implementation varies from one app to the other. As we have recommended time and time again that regular users should always go with OpenVPN. Because it is the best when it comes to available VPN methodologies. ZoogVPN makes use of AES (Advanced Encryption Standard) 256-bit cipher. AES 256-bit encryption technology has become the most widely used encryption cipher in the world. And if we are talking about commercial use then it is also the most secure option. There is one other difference between the free version of ZoogVPN and the paid version which we did not mention before. The free version of ZoogVPN uses the cipher key which is 128 bits long. That is what you get when you use ZoogVPN for free via its apps. The paid service comes with a cipher key that is around 256 bits long. How does that rank against some of the best VPN service providers in the world? Well, the best VPN service providers mostly use AES encryption but with a 256-bit key. But there are security experts who favor 128-bit cipher keys. Well, according to these security experts, no one has ever managed to crack AES 128-bit keys. Hence, regular users should find AES 128-bit key as strong enough. Their main argument is that we shouldn’t waste resources in trying to improve something with more security when it is already uncrackable. Such security experts do make a legitimate point. Because even if both encryption technologies offer the same security then the encryption technology with the longer key would require the user to have more processing power. Hence, that extra processing requirement may create unnecessary and irritating delays. Moreover, longer cipher keys also drain more of the user’s battery levels. And most mobile device users are already unsatisfied with their battery life. A longer cipher key would only make it worse. The one thing we have to mention here is that ZoogVPN had a great opportunity to integrate some extra features in terms of security into all their apps. All the best VPN service providers in the world come with advanced features. Advanced features such as a Kill Switch. The Kill Switch feature is starting to become a standard feature because of its usability. This feature basically blocks off all internet communication if it detects that the user doesn’t have active VPN protection. Moreover, the Kill Switch feature prevents apps on the user’s device from forcefully connecting to the online world via the internet without VPN protection. A Kill Switch feature can save the user for bad situations where sometimes the user’s internet connection drops but then quickly returns. In such cases, the user must have a guarantee, of sorts, that the VPN connects to the internet again first and then allows the rest of the apps to do so as well. There is another feature that we found ZoogVPN could have done with had they input more time in developing their VPN service. That feature is automatic Wi-Fi protection. This feature is also fast becoming a must-have feature. Automatic Wi-Fi connection is an essential feature nowadays for many reasons. They are now regularly setting up open and free WiFi hotspots. When users connect to these WiFi hotspots with a VPN protection, hackers can gain access to their mobile devices. then your device will try to search for available WiFi hotspots wherever you go. When it finds one, it will try to connect with it whenever it has the opportunity to do so. Hence, your device will automatically connect to a WiFi Hotspot if a WiFi hotspot doesn’t have a password to protect it. You could put your device into sleep mode but even then it would connect to that unprotected WiFi Hotspot. Hackers want your device to connect to their “free” WiFi hotspots. And remember, these WiFi hotspots aren’t really WiFi hotspots. These basically expose your device to many vulnerabilities. Hackers can download and/or exploit your device with a controlling software application. And the worst part is that you wouldn’t even know about it. Hackers could then do whatever it is they want to do with your device and then get out. All the while you are busy enjoying your coffee. Hence, you should use a VPN service. Preferably a VPN service that comes with features such as automatic Wifi Protection. ZoogVPN staff should read our review here and get on it as quickly as possible. The company advises the users that they shouldn’t ever connect to any P2P networks on any of its VPN servers that the company hasn’t marked for that specific purpose. As far as transparency goes, that is great. The company isn’t afraid to share the liability of its users who torrent on its VPN servers. But of course, it advises those users who only have P2P activity on selected VPN servers. Such arrangements also motivate VPN service providers to keep their users’ activities private. Moreover, it may even set the standard for the rest of the pack as far a privacy policies go. ZoogVPN does keep its users’ email addresses. Hence users need to make sure that they provide the company with their real email address when they are signing up with the company for a subscription package. Moreover, the company uses your email address as your identifier. It keeps all records related to the user’s usage and pegs them with the user’s email address. ZoogVPN doesn’t keep any logs. It doesn’t record user activity. And no, the company does not even keep connection logs. But it does keep a record of its customers’ data throughput totals. It keeps them both for downloads and uploads. Because the company has to monitor its free users who have to work with data caps. ZoogVPN app can sign users in automatically. And for that, the app needs to use a cookie. It stores the cookie on the user’s computer. Hence it needs the user’s credentials to make sure everything is in place. Can the data that ZoogVPN keep identify you? ZoogVPN doesn’t record enough information about its users for it to identify the users’ activities. Hence, users can rest assured that the company is taking care of their privacy needs. This is also great if law enforcement agencies and/or copyright lawyers come knocking on the door of ZoogVPN. Since the VPN company doesn’t have much information on its users it can’t possibly help them even if it wanted to. The official website for ZoogVPN looks and feels great. It looks like ZoogVPN has invested a lot of money in making sure that it has a slick marketing presentation. It provides new users with just the right amount of technical information. Such measures keep the user’s interest without overwhelming him/her. The homepage of the official website has a thick banner placed at the top. This banner eats up a lot of real estate on the main page. So your initial view of the site may only contain the company’s top banner. But as soon as the user starts to scroll down the banner disappears. The only thing that stays visible is the menu bar which initially appears just beneath the top banner. The menu also has the right amount of information. It gives users just five elements to work with. There is also an additional sign-up button. For registered users, there is the log-in link. For more links, the user has to scroll down all the way to the bottom of the page where the ZoogVPN footer section has a ton of more links. Among those tons of links, one link takes the user to the ZoogVPN official blog. There is also a separate client area on the official website. Subscribers who want to log in can use this area to log in. The client area of the official website doesn’t have a ton of features. But that is perhaps understandable. Because this area is for the users to come and donwload the app or the software for the company’s VPN service. If you scroll down further when viewing your account windows, the website will show you the details of all the VPN servers that you, as a user, can access. This screen also comes with other pieces of important information. This is also the screen that informs the user about which VPN servers he/she can and can’t use for torrenting. For free users, this screen shows them how much bandwidth they have remaining for the month and how much is the server load on each VPN server. Users who have access to the free account can go to the Servers page of the official website and check out the live status of all the company’s VPN servers. ZoogVPN is a generous VPN service provider in the sense that it allows users to access its support section regardless of the fact if they have a ZoogVPN account or not. Even if you are on the official website for the purposes of browsing, you can still access their support section. And most of all, you don’t have to jump through any extra hoops to do so. To access more support functions all you have to do is to go to the menu that appears at the top of the official website. The customer support section also has links for you if you need any setup instructions. There is also an FAQ page along with support contact pages. You can access these from the official website’s footer. If you go to the Support Center section of the official website, you can find the menu for more ZoogVPN support resources. The Support Center on its own has four elements that can help users solve their programs. What exactly is the Resources page? Think of it as a knowledge base. It basically has links to various articles that deal with subjects such as VPN service providers and general solutions to rather general problems. This knowledgebase section also has other solutions that the company provides itself. It also has a section for fixes to some of the most common technical problems that users come across on a regular basis. The FAQ page, as the same suggests, has quick and short answers for users who want to know more about ZoogVPN. There is also a VPN setup page. As the name suggests, this page offers instructions for users tho want to set up ZoogVPN the manual way. If you want to access the official ZoogVPN app then you have to go to a separate page. Users can access this separate page from the company’s software application interface as well. Or you can simply to go to your Account page and then access the page. Of course, you will have to log in before entering your Account page. The Support Center’s last facility for customer support is the good old contact form. If these methods didn’t cut it for you then ZoogVPN also has support in the form of a support email address. You can email [email protected] with your problems and their staff will get back to you with the required solutions. As with all other VPN service providers, if you want to subscribe to the service you will have to go to ZoogVPN’s pricing page. Another way to sign up is to simply go to the homepage of the official website and then click on the button that says Sign Up. So take whichever you want to take. As a reminder, both methods will take you to the official Pricing page. When you click on the button that says Sign Up, you can see the description of what you will get in the Free VPN service package at the bottom of the Pricing page. When you click that button, the official website will take you to another registration page with a form. The form will have fields related to the user’s name. If you are not comfortable with providing your name you can leave it altogether. But, ZoogVPN does require you to enter a legitimate and genuine email address. Because the company is going to require you to verify your email address before you can actually start to use the free VPN service. There is always a chance that you are one of those users who are not comfortable in providing their real email address. You can easily set up a burner webmail account. 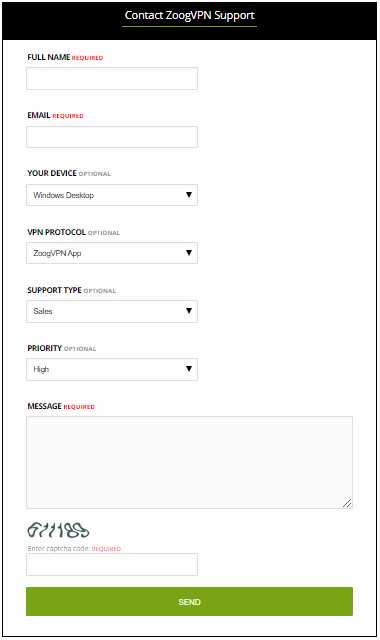 And then use that for communications with VPN service providers such as ZoogVPN. To actually purchase a subscription package just head to the Pricing page. And then perform a click on the package you want to buy. You will have to click on the button that says Select Plan. Each subscription plan will come with its own description. And then decide which one you want to up. 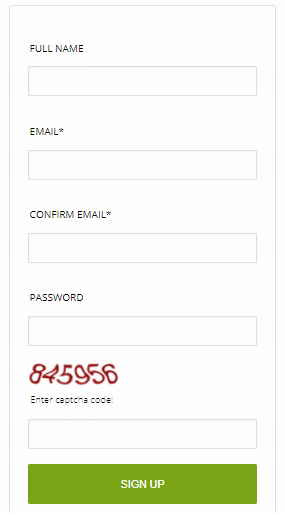 When you click the button, the website will show you a signup form. Then the website will ask you to choose your preferred method of payment. After that, the website will want you to enter your real email address. And then it will ask you for a password. What to do if you already have set up your account while signing up for the free service? Well, then you won’t have to go through the process of registration. You can simply click the button that links to the Login page. And as mentioned just now, you don’t need to fill out all the information about yourself again if you have already done so for the free account. Registration is only necessary when you want to set up your new ZoogVPN account. 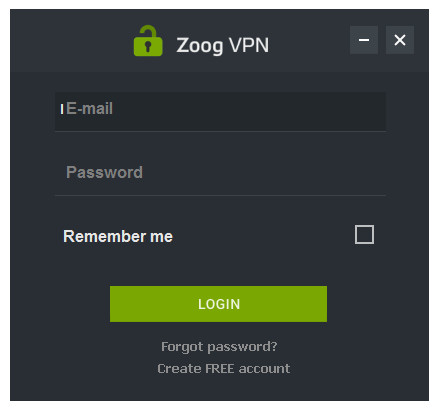 Remember that you may also want to set up your paid ZoogVPN account separate from your free VPN account. In that case, you will have to fill out your details twice. The ZoogVPN system will then go ahead and apply the VAT tax of the user’s origin country. But users who aren’t living in Europe don’t have to worry about this VAT thing. They can access the service without VAT. But we will say that if you actually live in some other country that doesn’t come under the jurisdiction of EU laws and you want to travel to EU in the near future, then perhaps it is best if you sign up for this VPN service provider before you leave for EU. Because that way you can easily avoid playing that above-mentioned sales tax. After you have input the above-mentioned details you would want to check two other boxes that are present beneath your bill. If you don’t do that then ZoogVPN won’t allow you to purchase its subscription package. There is also an option for a repeat billing arrangement. If you are comfortable with that then go ahead and check that box. For new users, we recommend that you uncheck the box that enables recurring billing. Because you don’t want to automatically pay a VPN service provider out of your account month after month for years on end. After you are done with the previous options simply click the button that says Continue To Checkout. Doing so will actually process your payment. ZoogVPN system will then make sure that your payment gets through. After it has verified your payment, the company will send you a confirmation email. Once you receive the email you will have to open that email. And then click the link that will verify your email address for ZoogVPN. Once you have verified your email address, ZoogVPN will activate your VPN account. After you have created your account you must go to the official website’s client area. From there you will have to download the installer for your operating system. Then after that, you will have to run that installer. Once the installation has finished, the installer will itself create a desktop app shortcut for you. The shortcut will come in the form of a ZoogVPN app. There is one annoying problem here. That problem is that the installer will require the user to restart his/her computer after the installation has finished. If you don’t restart your computer, the installer won’t be able to finish the actual install. So restart your computer machine. Once you have logged back to your desktop machine and if you want to run the ZoogVPN app, then click on the above-mentioned shortcut. Doing so will grant you access to the app. After running the app, ZoogVPN VPN app will show you a login page. The first time around you will have to enter your password and your email address. Remember that you will have to use the email address that you provided to the company when you registered for your subscription plan. If you don’t want to log in every time you restart the app then check the remember box. This will automate the process of signing in and you will never have to enter your credentials on your subsequent visits. The ZoogVPN app itself is extremely simple. What we mean by that is the app simply shows the user his/her IP address at the very top of the main window. It also presents the user with a server selection field. That is located at the very bottom of the main screen. So what is in the middle? The middle has a connection button. But you shouldn’t just sign in to the app and just turn the VPN connection one. We recommend that you should first go to your Settings page. To go there you will first have to click a symbol. That symbol is that of a cog. It is located in the left-hand corner of the screen. When you go to the Settings menu you need to carry out a task. That task is to select between TCP (Transmission Control Protocol) or UDP (User Datagram Protocol). Well, TCP basically monitors the whole of your connection. It also makes sure that all of the user’s data arrives sequentially. If we are talking about traditional practices, then it is true that most if not all internet applications used TCP as their default method. But that doesn’t mean there is no room for UDP. UDP works better for applications that can expect a rather high volume of data. UDP does not have any features for session management procedures. With that said, we also know that all video and voice applications need to give the user a fast experience. Hence, they must have built-in processes to deal with such functions. It is also the reason why voice and video apps usually run over User Datagram Protocol or UDP. There is no reason for you to go into this VPN thing that deeply. These are basically the technical details on how VPN services work. If you are not a techie then it is better to skim over this section. In other words, it is best for you to simply leave the UDP or TCP option to Auto. With that said, now is the time that you should make your way back to your app’s main menu. You can do that by simply clicking the symbol that comes in the shape of a house. It is usually located on the left side your screen. At the top, most of the times. When you have hit the Home button, then you need to choose a VPN server. As mentioned before, the free service of ZoogVPN doesn’t give you much in the way of VPN server choice. In fact, the app will itself adjust and show you the VPN servers that you will have access to while you are on the free version. The three free VPN servers usually appear at the very top of the VPN server list. If you are on the free version, the app will show a green text next to all the premium VPN servers. The text would say something like “Upgrade”. If you have bought a subscription plan, then you won’t see the Upgrade button. The app will also show you a P2P symbol right next to the VPN servers that allow P2P file transfers for torrenting. All you need to do in order to connect to a VPN server is to select one from the list and then his that big connect button in the middle of the main screen of the VPN app. Once you have connected to the internet via the VPN service, that big connect button will change its color to green. Moreover, the app will also show you a counter. This counter will show you numbers related to your VPN session. You will also see an IP address at the very top of the app screen. It will change everytime you change your VPN server. This number will basically show you your new IP address. Basically, it is the IP address of the VPN server that you are connected to. It is also the IP address that the rest of the world will see when it wants to monitor your device via your internet connections. Normally reviewers try to test VPN service providers in a certain way. Our research for this ZoogVPN review shows that it is best to test ZoogVPN by setting the system to use OpenVPN over UDP. Then you simply go to a speed testing site such as testmy.net. Perform multiple tests to average out the results. Make sure that you change VPN servers as well to get a broader idea of the quality of the VPN service. Our research for this ZoogVPN shows that you should expect some decrease in your download speed when connected to a VPN server in the United Kingdom. Of course, the actual speed results will largely depend on the speed of your internet connection. If you want to check if your ZoogVPN has actually changed your IP address then you can go to sites like IPlocation.net as well. This site will, hopefully, let you know the location of the three free VPN server that come with your free version of ZoogVPN app. The free app has VPN servers that are located in Colorado, Amsterdam, and London. 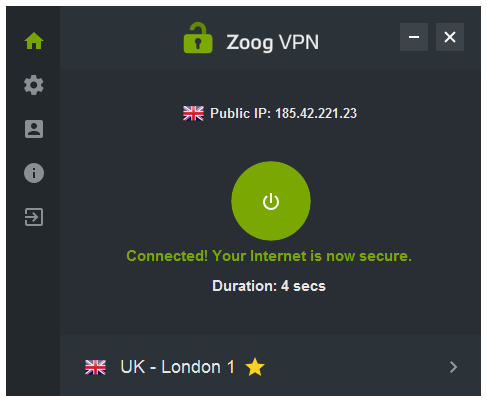 Our research shows that zoogVPN has its VPN server in Enfield, North London. While the Amsterdam server is located in Roosendaal which is near to North Brabant. That is a good distance away from Amsterdam. Our research also showed that ZoogVPN US server was located in McAllen, Texas. If you really want to know how good a VPN service is, then as mentioned before, test it on different servers. Our research shows that, in the case of ZoogVPN, it is best to use the one in Amsterdam and the one in London. To test via the speed test site, you need to first test the results without using a VPN service provider. Then you need to turn on the VPN service provider and then test again. After that, you need to compare the two results multiple times. What Does Our Research Show In Terms Of Results? In terms of actual results, our research shows that ZoogVPN European VPN servers gave respectable results as far as upload speeds are concerned. Moreover, you can expect ZoogVPN to give you decent speeds which are comparable to some of the internet service providers while they are working without a VPN service. Interestingly enough, ZoogVPN US server gave less upload speed when compared to the UK server. That is really strange as usually VPN service providers have their fastest servers in the US. Okay, that is it for upload speeds but what about download speeds? Are they the same as well. Our research for this ZoogVPN review shows that the decrease in speed reversed when it came to European and US VPN servers. In other words, European VPN servers reduced download speeds by up to 66 percent when compared to the download speed of the internet connection without a VPN service. The US VPN servers actually managed to equal the download speeds of the internet connection when it didn’t have any VPN service protection. Users who want to carry out some more tests can use sites such as ipleak.net while they are connected to one of the ZoogVPN servers to check for IP Leaks. IPleak.net also tells you the location of your IP address. The site, in our research, showed that indeed ZoogVPN had a VPN server in McAllen, Texas. All calls to DNS servers (Domain Name System) went to US locations. Hence, the ZoogVPN never leaked any Ip address to show the original location of the user. There is one other site that you can access to check the status of a server. Our research shows that this site too shows that all of the user’s DNS references went straight through the servers that were located in the United States of America. Doileak.net also tells you the time zone settings of the user’s computer machine. It can then compare that with the IP location of the user. So if a user was located in China and used a US server, then this site would show the user that his timezone was not compatible with his IP address. If your internet service provider does not use Internet Protocol version 6 or IPv6 addresses then you don’t need to worry about whether the ZoogVPN app leaks those or not. Our research shows that if you connected to a ZoogVPN VPN server based in London and then try to stream something from streaming sites in the UK, you will fail. Our research shows that Netflix UK and BBC iPlayer both would have no problems in detecting that you are using a VPN service. Hence they would block your connection to their streaming services. However, ZoogVPN will work with other streaming services such as Channel 4 and ITV Hub. Our research shows that if you connected to the Colorado VPN server and then try to watch US Netflix you will, again, fail. The US Netflix site will tell you that you are using a VPN server and hence will block your connection. In other words, it will not deliver you any entertainment. You should expect the same thing to happen to you if you try the above procedure with other US streaming sites such as ABC and others. ZoogVPN will work with NBC though. ZoogVPN representatives will tell you that some of their US VPN servers will work with US Netflix. 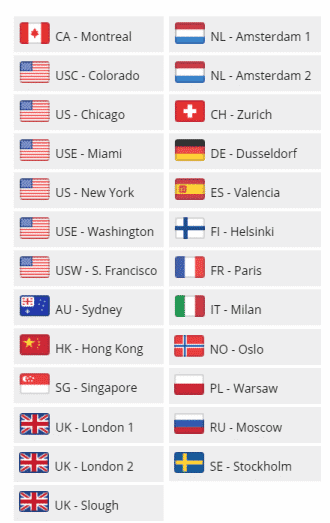 Our research shows that if you use the US server in New York (which is only available in the paid version of ZoogVPN) then you can indeed watch US Netflix. However, don’t expect the same with the ABC streaming website. Does it work with the paid version VPN servers? Our research shows it doesn’t. BBC iPlayer will block you regardless of the fact if you are using the free or paid version of ZoogVPN. Users who want to use the PPTP protocol can do so for all platforms except the Mac OS. ZoogVPN is one cheap VPN service provider that is actually good. Its free version is reasonable as well. As far as data transfer security goes, ZoogVPN does all the right things. Moreover, its privacy procedures also fit the bill. The company has dedicated apps for all major platforms. So what is the problem with this VPN service provider then? Well, it doesn’t have any advanced features. Modern-day VPN service providers must offer advanced features such as automatic WiFi protection along with a kill switch feature to compete with the very best out there. Lack of advanced security features such as automatic WiFi protection. There is no harm in trying out ZoogVPN. Because it has a free version. Moreover, you can make the most of the company’s seven-day money-back guarantee with its paid service as well. ZoogVPN gives you all the opportunities you need to test out its service. And then decide if this is the right VPN service provider for you which can fulfill all your security needs. Of course, you will have to make sure that you have some spare time in the following week when you eventually do sign up for the company’s paid subscription in order to avail the seven-day money-back guarantee.